The resort, on Hawaii's Big Island, features a golf course, six restaurants, and a 10,000-square-foot oceanfront pool. It also features a "Spa Without Walls," where the 110-minute Ali'i Royal Experience is available for $369 and a 50-minute couples massage runs $549, according to the spa menu. While at the spa, guests can snack on a gluten-free grilled prawn summer roll for $19. Trump canceled his Christmas trip to Florida and remained in the White House, saying on Christmas Eve that he was "waiting for the Democrats to come back and make a deal." The president left the White House on Christmas to travel to Iraq and meet with American troops stationed overseas. Trump has been holding work meetings since Congress went into recess, including one with Department of Homeland Security secretary Kirstjen Nielsen on how to fund the administration's border security plan. Pelosi, meanwhile, has been speaking to the press. She gave an exclusive interview to USA Today just before Christmas calling Trump a "fear monger." "He talked about terrorists coming in over that particular border, which wasn't so," Pelosi said. "He's using scare tactics that are not evidence-based, and it's wrong." Trump has said he will not sign a funding bill that doesn't include funding for construction of his border wall. Pelosi is set to take over as speaker of the House in the new year, setting off an immediate standoff with the White House on legislation to reopen currently unfunded federal agencies. This is not Pelosi's first holiday vacation to Hawaii. 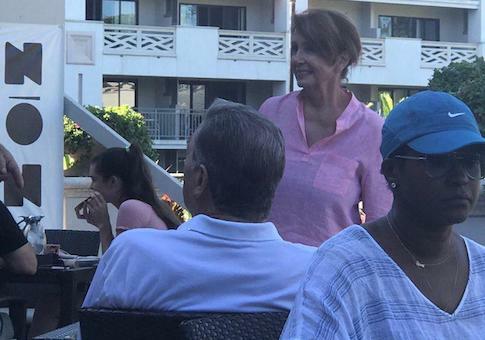 In 2011, it was reported by the Hawaii Reporter that Pelosi had in previous years stayed in a $10,000-a-night suite at the Four Seasons Resort in Kona for her holiday vacation. This entry was posted in Politics and tagged Nancy Pelosi. Bookmark the permalink.